This one-day interactive workshop takes delegates through all the practical steps needed to market their service. 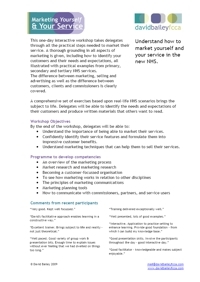 A thorough grounding in all aspects of marketing is given, including how to identify your customers and their needs and expectations, all illustrated with practical examples from primary, secondary and tertiary NHS services. The difference between marketing, selling and advertising as well as the difference between customers, clients and commissioners is clearly covered. This workshop will allow you to educate your customers to understand your service to make best use of it. Practical tools to turn features of your service into benefits for your customers are covered, together with using the Marketing Mix in health. All essential jargon is fully defined and explained. Understand the importance of being able to market their services. Confidently identify their service features and formulate them into impressive customer benefits. Understand marketing techniques that can help them to sell their services. This one day workshop is designed for all NHS managers and clinicians. David’s dry witty approach is complemented by his inside out understanding of the subject matter. This combination makes him a very good teacher in his field. Despite not being a clinician, I believe what makes David stand out, from the perspective of a recently qualified GP and Darzi leadership alumni, is his unrelenting awareness of the ‘clinical’ impact of his work to improve the quality of patient care in the NHS.